The rise of the "Blockchain Technology" is opening new frontiers for existing automotive Electronic Data Interchanges (EDI) data pipeline. It is destined to bring in the enhanced system stability by establishing a seamless (authenticated) relationship between an auto manufacturer, an original equipment manufacturer (OEM), and an auto dealership, and data needs to flow in both upstream and downstream. As we know, Advance Shipping Notice (ASN) is one of the definitive "best practices" of an integrated supply chain in the automotive sector. Through which dispatches and validations, generally reside with the supplier. And, the selection of Value Added Network (VAN) or ANX Certified Service Providers (CSPs) is their own headache. Any kind of time delay can invite penalties from the Original Equipment (OE) which directly affects the rating of the OEMs. So, its pure management level blame-game scenario. However, from a system integrator's point of view, its very important to assist OE's Suppliers to get armed with right network and right EDIs - mostly in North America, its EDI 856 workflow. However, do keep in mind, there would be certain bottlenecks - the first one is the cross-border data transmission (which imbibes the data privacy and security clauses, in case any OEM is getting the parts from outside the US) and the second one is the adoption of United States-Mexico-Canada Agreement (USMCA), particularly the Chapter 4: Rules of Origin, which proposes major changes to the way automobiles and automotive parts qualify for preferential treatment. In turn, which might affect the ASN to a certain degree in terms of compliance, if not architectural changes. So, the question still remains whats the future? And, the answer lies in end-2-end (e2e) automation with manual override only during the occurrence of critical cases. Also, here comes the second question - are we future-ready? the answer to this question needs a bit of cross-functional R&D. Any system workflow should always get designed on "flexi-field" concept, and with open logic. So that, any structural changes in the future should not lead to a change in coding. But, how we make sure the validations are accurate, timely, and unadulterated. In such cases, a system integrator needs to innovate. Such as, by adopting evolving "Blockchain Technology". How does a Blockchain Technology will Work? 1. A Group of OEs/OEMs, OES, Third-party Logistic (3TPLs/4TPLs) and auto dealerships create a "Crypto Currency", say AUTOCOIN and a "Crypto Exchange", say AUTOCOIN-XCHANGE. Later, get it deployed over the BigchainDB (An opensource blockchain DB, which can be downloaded on a Linux Server and installed via Docket) or SAP Leonardo. 2. AUTOCOIN also creates a Crypto Wallet, say “AUTOWALLET”. For each batch of production, the OE will buy some AUTOCOINs in the created AUTOWALLET. The amount is exactly the number of components multiplied by 0.00000001 AUTOCOIN (lowest AUTOCOIN transaction value set by the group itself). Kindly do note, publicly traded OEMs can not disclose each transaction for each AUTOWALLET. Possible Workaround, OEMs can create multiple AUTOWALLETS. 3. An example of a transaction: 2,000 components of Tapered Roller Bearing from OES 1 need to be procured, the OEM has to buy 2,000 x 0.00000001 AUTOCOIN = 0.00002 AUTOCOIN. One can fix the price for AUTOCOIN by its own (annually, half-yearly or quarterly), later as the transactions grow within the system, the price of an AUTOCOIN can be dynamic i.e., system trading dependent - this will be purely a management call. 4. When the OEMs uses the Tapered Roller Bearing on an assembly line, the cost 0.00002 AUTOCOIN from his Procurement Department owned AUTOWALLET wallet to the Production-owned AUTOWALLET. When the Production department pushes the completely assembled car to the Sales Department, 0.00002 AUTOCOIN of Tapered Roller Bearing get added to the overall valuation of the car in terms of AUTOCOIN. When the Sales department dispatches the car to dealership stockyard it will push a certain amount of AUTOCOIN as a marginal gain associated with make and model to Dealerships AUTOWALLET. 5. The new retail buyer will offset the AUTOCOIN cost incurred by every element in the chain by the purchase he or she makes at the dealership, and hence it closes the cycle. However, this cycle can be extended to Vehicle maintenance by opening an AUTOWALLET in the name of retail users, which could lead us to a different tangent in our current discussion. 6. The protocol to automatically check if a transaction is an authentic one: each time you receive an ASN (with AUTOCOIN, quantities, supplier codes, and date code), you automatically check that you have received AUTOCOINS in your AUTOWALLET for the same quantities that were in the OEM's Master AUTOWALLET at the time of the date code. If the transaction is not authenticated, you get an alert even before receiving the components. It’s possible to develop an open-source protocol that anyone can use to collect advance shipment notices, check the wallet, raise request, send the alerts through Blockchain-enabled system. So, this process actually guarantees "Supplier Ratings" are Clean and are validated in real-time without giving anyone, any chance to tamper it. 7. When sending an ASN via EDI, the organization would also send the AUTOCOIN linked with an AUTOWALLET or AUTOWALLETS. If a Supplier or an OEM or anyone in the chain knows that he will not have to resell some components (for example, the production is done), he can sell the AUTOCOIN against USD, EUR, or any other real-world currency within the system if the system operated in tandem with AUTOCOIN-XCHANGE. As mentioned earlier, the initial cost of the AUTOCOIN goes back into the end customer’s pocket. Manufacturers can just add it to their sale price (remember it’s just $0.00002 per component in the case of Tapered Roller Bearing). But, to remove the ambiguity, AUTOCOIN has to be traded outside AUTOCOIN-XCHANGE, so that players can just immediately sell the AUTOCOINS and redeem it into actual currency (legal tender). 8. The cost of AUTOCOIN could be set in such a way, which makes them acceptable compared to normal shipping and handling costs. In fact, it is comparable to the cost of operating any type of tags (Radio-frequency Identification - RFID). It intends to be much cheaper than the OEM's "Certification and Compliance for Vehicles and Engines" paperwork process, and with this new system, Chain of Custody (CoC) would be rendered unnecessary. With this system, the only way to sell 100 counterfeit components is to own another 100 real components of the same manufacturer part number and the same date code. However, if you sell the 100 counterfeit components through the system, one cannot prove which part is the real and from which supplier. So, it will eventually affect the supplier ratings. To avoid such scenario, part registration (universal item codes with proper categorization) has to be approved beforehand by the AUTOCOIN-XCHANGE's smart contracts (if and when the pre-defined rules are met, the agreement is automatically enforced). Only if all parties in the chain are digitized, the efficiency will be raised dramatically. That brings us to the question who pays for the initial investment in the Blockchain-based EDI system. Keep in mind the margins are very small, so one can’t put the additional cost on selling price. So this investment has to be taken with the hope of amortization of the cost in the future. As Frank Claney of Cleo has rightly said; "EDI isn’t going away." 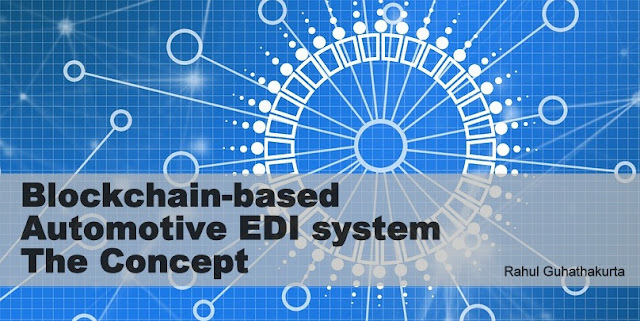 To simply summarize it, a Blockchain-based EDI system is just not about solving a problem(s). It's more about boosting the capabilities of the existing system by providing a holistic approach. But, the key to success is nothing but bringing in the agility and robustness in the most economical way and for that, all the important players need to be in the "same book" so that they can be on the "same page" in the near future. The ideas mentioned in this article is in the conceptualization stage. Critical input from the academics and industry solicited. Rahul Guhathakurta (ORCID: 0000-0002-6400-6423) - Founder/Publisher, IndraStra Global. He is a seasoned retail and supply chain consultant with cross-industry experience spanning across 3 continents. He regularly tweets at @rahulogy.